August 4 and 5, 2012. Followings are the scenes from student volunteer coordination at peach farm on August 4 and 5, 2012. Main activity is removing leaves from peach trees. This is one of most important process to cover every peach with sunlight evenly. Even skilled farmer can only do this process to one tree in a day. Luckily, the situation this year is better than last year. Still, harmful rumours damage sales of peaches. “In 2011, the earthquake year, I finally received gold award at a competitive exhibition of farm products. I will try to get same award once again.”, he continued. 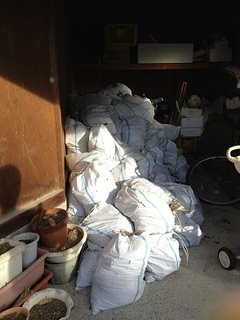 One of student volunteer commented that his positive thinking broke my image of Fukushima farmers. It was very nice to know. Residents can now visit the area. Still, destroyed buildings and rubble are left in town. There are no space for home to rubbish to throw away, and no choice except keeping them at home. They also stopped at the terminus of Route 6 where still designated as a restricted area. Ms. Kume, a volunteer of BFF said “Let me wait here. My heart still aches when watching guards”. Students must have felt something watching her. Students again removed leaves from peach trees at research farm Sakura Nursery. 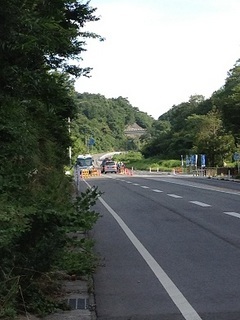 The son of Mr. Kato taught the work. “I used to dislike that my parents run farm as uncool, although I know that my farm’s peach is very tasty. I gradually became to be proud of my farm watching customers happily purchasing them”. “However, we can’t help closing the farm if the sale stays low as last year”. He said. A lot of students said that there was a gap between the image informed from media in Tokyo and real Fukushima. In Tokyo, media often cover damage caused by harmful rumours to farm products. The students must have realised the reality of farmers, not only negative information through media but positive and still severe reality of the farmers. Next tour may be held in apple harvest season.